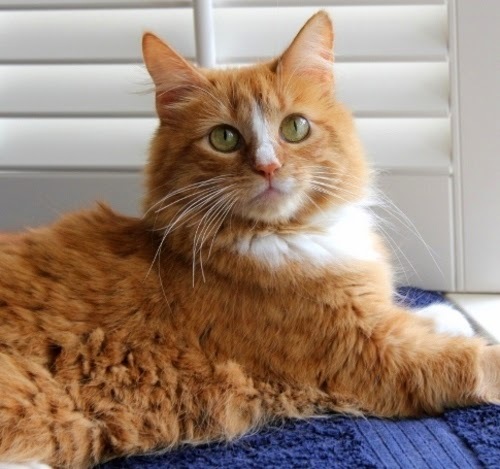 June Bug was a beautiful 2-year old long hair orange and white female Tabby. She was a resident at the Humane Society during the summer 2010 along with cages and cages of surrendered cats and kittens waiting for their luck to turn. Under the pressure of so many cats coming in daily, the Austin Humane Society and the Town Lake Animal Shelter widedy advertized a "free adoption" week-end and people were waiting in line to choose their new cat. On that day, June Bug went home with her new adopter. A few months later, June Bug became a rear leg amputee after she was found hanging upside down, her right leg caught in a privacy fence. We don't know how many days she had been hanging there, but we know that her owner did not bother looking for her when she went missing. A neighbor found her and rescued her, but her leg could not be saved. Cats' Angels was approached by the compassionate lady who found her, and we became involved in her rescue. At first, she recovered wonderfully from her surgery and coud run and play. She could not jump because her rear left knee cap tended to go out most of the time, she needed more surgery to correct that. We could tell that she still had some pain at times, but in spite of her trauma, June Bug turned out to be a kitty in love with life. She was quite social, enjoyed playing with her toys by herself and with people, and she was able to climb the elaborate stairs assembled for her to watch the birds and the squirrels in the yard from a window. She seemed happy to be alive. The time came when we thought June Bug needed a forever home where she would continue to get the attention, care and affection she needed. However, her rear left leg continued to worsen, and she was under increasing pain. A visit to the specialist did not give us much hope for a pain-free, quality life for our beautiful June Bug, and we had to make the difficult decision to set her free of her hurt little body. June Bug was a very brave kitty, she was remarkable in many ways, we love her and like to think that God adopted her. She will brighten the heavens for the angels as she brightened our lives when she was with us. June Bug's owner was informed of what had happened when she was found, but declined to be involved in any way. In fact, the day June Bug went missing, her owner decided to go back to the Humane Society, this time to adopt a "free" dog, which she was able to do. Cats' Angels is strongly opposed to giving away a cat or dog for free, we believe that for most people, a "free" cat or dog has no value and many owners of such animal will not understand the responsibility that comes with a pet adoption.